Using a putting mirror is one of the very few ways you can see precisely what your faults are. Top pros use mirrors all the time to check their alignment and address position. If you're having a rough time on the green, it's a good idea to know what precise position you were in - relative to the ball - at a time when you were putting great! Some of the fundamentals of putting are easy to check using this training aid which you put on the ground underneath the ball. Most important of these are the position of your eyes and the alignment of your shoulders. In order to judge this alignment accurately, make sure you purchase putting mirror with a set of parallel lines for the ball to target and shoulder alignment. Opinions on precisely what position to have your eyes are divided. Dealing first of all with how far from your feet to have the ball, Nick Faldo, Luke Donald and putting guru, Dave Pelz all believe that the ball should be directly below your eyes, whereas putter-maker-extraordinaire, Scotty Cameron and Ben Crenshaw advocate a ball position that is slightly outside the eyes (i.e. further away from your feet). Nobody, however, thinks that the ball ought to be closer to your feet than a line directly below your eyes and you can easily check this with this training aid. Similarly, having your eyes slightly behind the ball is thought of as a good thing by Jack Nicklaus and Phil Mickelson, as this lets you see the ball to target line better. Faldo, on the other hand thought the ball should be directly below a point right between your eyes. They were all great putters, so you can experiment using the mirror to find out what's most effective and comfortable for you. Once again, there is a consensus on what not to do.... Nobody thinks you should have the ball towards the back of your stance with your eyes above a spot in front of the ball. Exact ball position, therefore, is personal to you, and you should experiment with it. The great thing about seeing your reflection when setting up on a regular basis is that when you have found something that works for you, you can always come back to it. 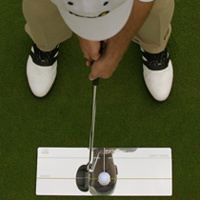 A putting mirror is a reasonably-priced training aid that most serious players own. Make sure you buy one with lines on it to allow you to check the alignment of your eyes and shoulders. These products are fairly generic so one is more or less as good as the next. Price, therefore, should probably be a guiding factor! Search for putting mirrors here!